I have noticed over the past 24 hours or so that Litecoin seems to be holding up rather well compared to all the other main cryptos by market cap. Does anyone have any thoughts around the reasons why this may have been the case? I noticed some articles from Charlie Lee (founder of Litecoin) in this same period online. I am not a fan of Litecoin but have a look at below. Litecoin has been rallying for the past two weeks which is shown by the chart below. It has made a new month high and it seems to be performing stronger than Ether, Ripple and Bitcoin Gold which were the original colleagues of Bitcoin on IG's platform offering. I am not a huge fan of Litecoin but I do trade it because generally cryptos move together and it is cheaper and more cost effective during such bull moves to trade Litecoin ahead of say Bitcoin. Litecoin is up over 14% at the time of writing and was higher earlier on. It has been one of the better performing Cryptocurrencies which IG offers on its platform during this recent upsurge in the sector. The margin requirements are more reasonable than the likes of Bitcoin and Ether and therefore leverage can be used more cost effectively on it. It is cheaper to trade than its friends. Since the 14th December 2018 it has been on an uptrend making higher highs and higher lows. It has been rather volatile which is expected of course on Cryptocurrencies. Litecoin's 20, 50 and 100 DMA's are sloping upwards and its 200 DMA is sloping downwards. The inference I make from this is that it is still in its long term downtrend but there has been a short time frame trend reversal which is what we are witnessing now. 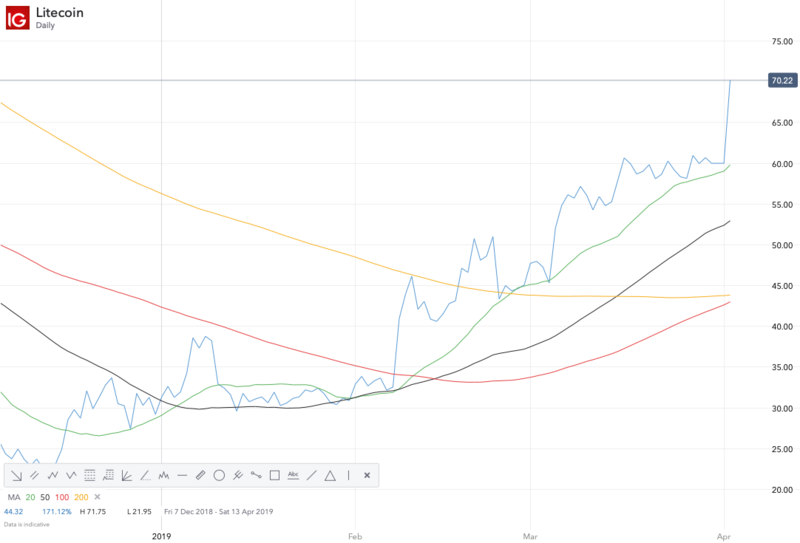 The other interesting factor here is that currently Litecoin is trading above its 20, 50, 100 and 200 DMA. The downside risk to any potential 'long' trade on Litecoin is that it can turn viciously and quickly against you and begin a counter down trend instantly and therefore the likelihood of losses are high. To counter this one could merely day trade Litecoin on the long side to try and keep losses to a minimum. I attach the chart below for your perusal. First of all the spread is not too bad though it could be better. The price is trading above its 20, 50, 100 and 200 DMA. The 20, 50 and 100 DMA curves are sloping upwards which is bullish. Of course even taking into account the above factors this is the Cryptocurrency Universe. Here there can be a quick and sharp trend reversal followed by a large decline so even a long trade would be considered a high risk trade. Stop losses would have to be managed effectively taking volatility into account. Litecoin can process transactions a lot quicker than Bitcoin. Litecoin can produce more coins. 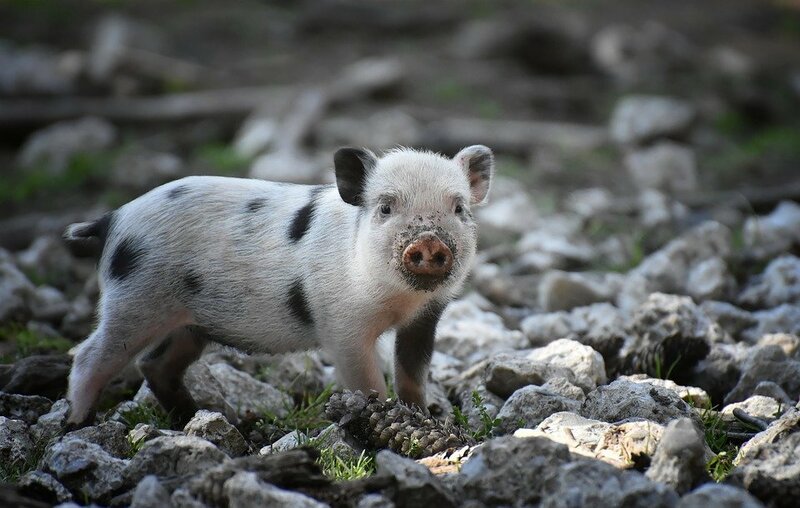 It is concentrating on secure transactions and fungibility at this moment in time. Warning: Litecoin is high risk and there is plenty of downside risk on any long trade. This morning it seems Litecoin may be looking at a move down. It could be profit taking, it could be new shorting opportunities or the selling could lead to stop losses being triggered. It seems this morning Stellar is the 'flavour of the day'. I actually predicted that Stellar would have its turn due to the price action on all the other Cryptos. My prediction was both Stellar and Ripple will have some positive price action in line with the others that we have witnessed recently. It seems they are all fighting and jostling but Litecoin is ahead of the current race at this moment in time. 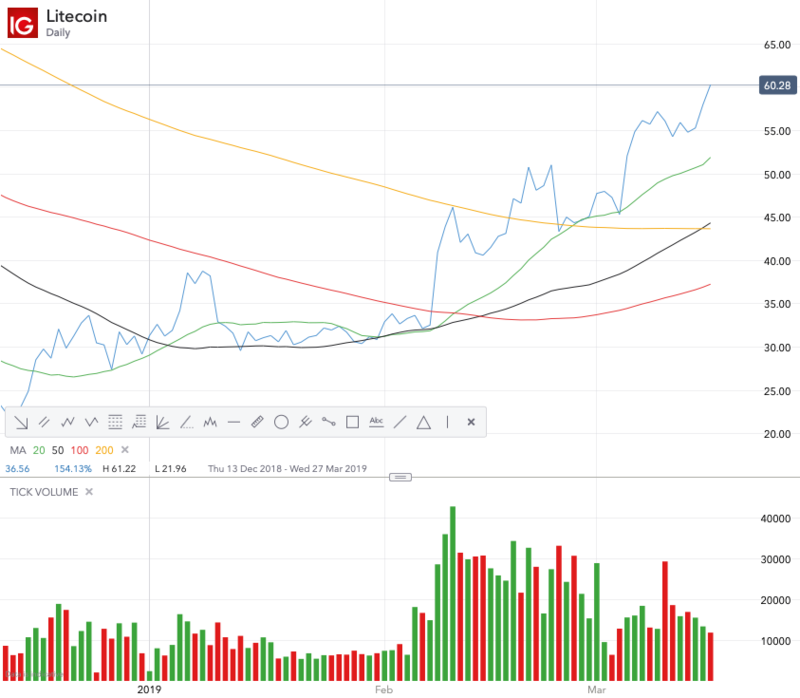 Litecoin is continuing its aggressive rally upwards. As you can see from the chart above the volume is picking up in February 2019 and March 2019 compared to previously. This increase in volume is also supporting the price action which is bullish. 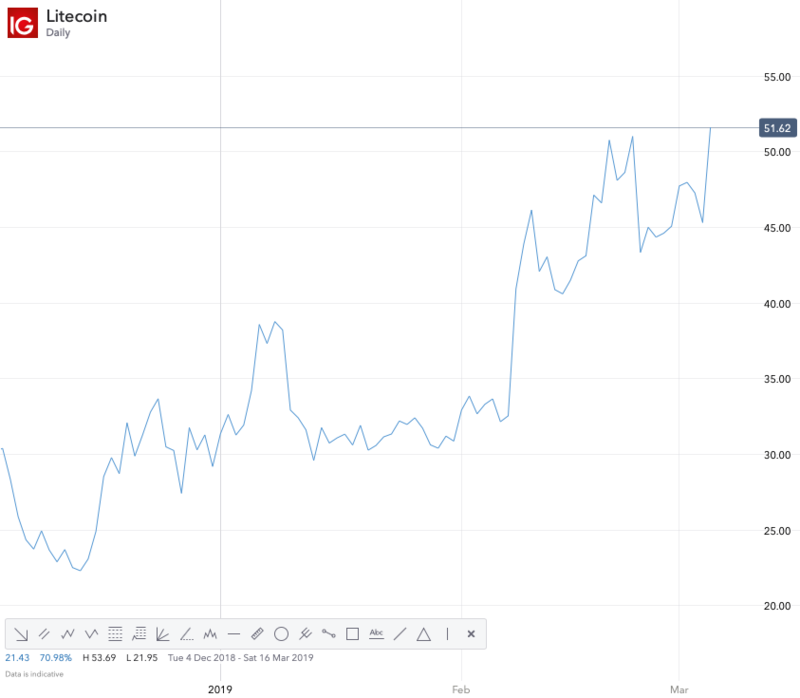 Litecoin is also making higher highs and higher lows since middle of December 2018. Is Litecoin a buy? The only thing that concerns me is the curve of the 200 DMA. It is sloping sideways and it is clear from the chart that Litecoin is in a long term downtrend still. Cryptos have rallied before and then just come crashing back down. This could happen again so would need to see more healthy pull backs and upward continuations before this trade is de-risked a little bit. This is still a high risk trade on the 'long' side for me. Some healthy consolidation and then another move upwards may offer a more solid foundation for Litecoin. Litecoin is trying another attempt to surpass 60.00 and stay above it. This article is interesting highlighting why Litecoin prices may have doubled. One must bear in mind that these are the views of the author and we all may have different views on whether we agree with the author or not. I am not suggesting this article is entirely credible so I accept there may be credibility issues. Also when these types of articles come out a trend reversal normally follows in Cryptocurrencies! LOL. Litecoin is getting rather interesting. One thing for Cryptocurrency traders who are thinking of trading it on the long side is to be prepared mentally for any sharp reversal and strong downward move. This has happened over several Cryptocurrencies in the past few years. Long term trends generally are still downwards. This article illustrates nicely how traders can make a relatively nice profit using leverage within reasonably short timescale on Cryptocurrencies. 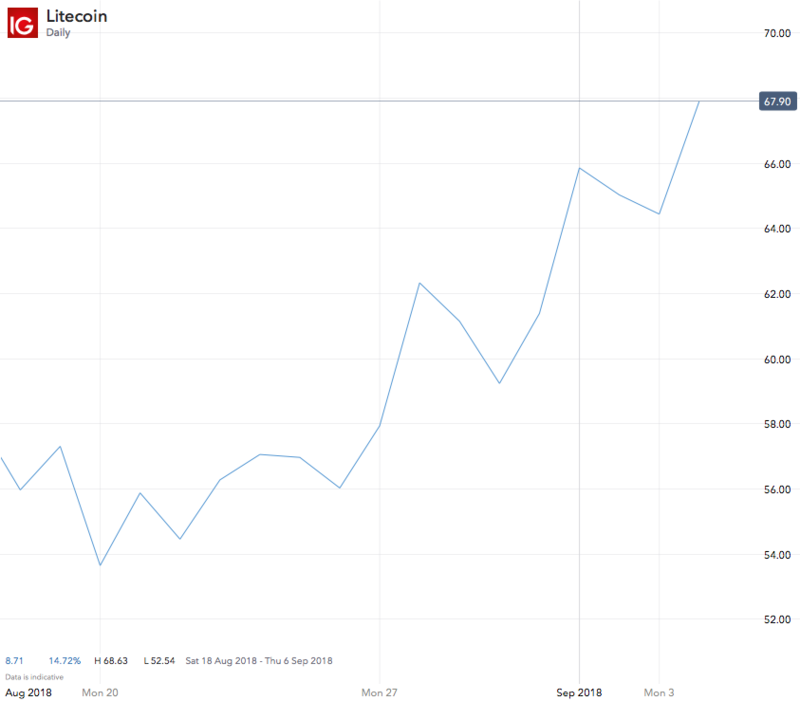 Litecoin is continuing its impressive upward move. Of all the Cryptocurrencies on offer through IG's platform it is only behind Bitcoin this morning around 5:40 am. I stand corrected. In real time it is up a staggering 9% and now performing higher than Bitcoin and is the best performing Cryptocurrencies at 5:42 am. Litecoin is up over 17% which is 11 hours after I posted the above very early in the morning. I want to show you the following 'daily' chart and how the price is above its 20, 50, 100 and 200 DMA's. Not just that but how none of the moving averages curves are sloping downwards. This is a bullish sign to me that the trend is changing over a more longer time period. Also we are seeing 'Higher Highs' and 'Higher Lows' formed which again is another bullish indicator. For those who have been trading Litecoin on the upside will agree that it has been a great 'long' trade from around the middle of December 2018 till date. Litecoin is above 21% at the time of this post. It has just got stronger and stronger throughout the day. What will be interesting is what happens when markets in Asia open? I would not be surprised to see Litecoin hitting the psychological $100 mark in the coming weeks and months. The way the chart is spiking upwards like a rocket, I personally cannot see anything other than a large sell off / correction phase coming soon. Stop loss management will be key as one does not want to be stopped out if the move continues upwards. Likewise one must exit should the price decide to plummet. Setting effective stop losses is extremely difficult when you have a volatile asset class like Cryptocurrencies which are trending strongly upwards but you know a sharp sell off can occur at any point. Trading Cryptocurrencies is not for the feint hearted and it is certainly not easy. A high tolerance to risk is required. Of course there is a short term shorting opportunity here depending on if it follows Fibonacci retracements or something else. For anyone wanting to go long they must let the drop occur before entering long. This is the same for any of you who want to add to your positions. As the increase was big, sharp and quick, the drop should respond accordingly. There is always the risk that this was a false rally but time and price action will confirm that in due course. It is important to stay focussed on the price action as taking your eye off could mean you miss some of the best days in the year which make a lot of difference when looking back at overall returns. I should have done this at the start of this thread but will share Litecoin's website for those who are interested to look at. The question is whether this is priced in already?